Join the Everest Peace climb! Climbers from all religions needed. The Year 2003 marks the 50th anniversary of the first ascent of Mt. Everest– one of the greatest physical achievements of the twentieth century. On this glorious anniversary, The Everest Peace Project is organizing an expedition to climb Mt. Everest, which will include climbers from every major religious tradition. Although we will celebrate our diversity and our differences, this is an event that will focus on our commonality. We will climb together not as individuals who belong only to this or that nation or religion, but as a team–as brothers and sisters who all share a common home: the earth. This climb will not just be one of physical strength and endurance, but a climb for peace, religious tolerance-education and understanding. The climb will also be a humanitarian endeavor, for we will be raising money for our charity. It is our goal to show that people from all races and beliefs can come together in a peaceful way and set an example to the world that we can all unite for peace and religious tolerance. There will be no national or religious flags, the symbol which we will wear on our clothing and the flag which we will proudly plant on the top of the summit of Mt. Everest will be that of the earth. "A multi-religious expedition to climb the world's highest peak promoting peace and religious tolerance has been announced in Nepal. Organisers say a team of 10 climbers representing seven major faiths from around the world will try to climb Mount Everest next year. The landmark event coincides with the 50th anniversary of the first ascent of the mountain. The climb is being organised by a non-governmental charity, the Everest Peace Project. Lance Trumbull, a spokesman for the group, said the climbers would follow the southern side of the mountain in Nepal on their way to the summit. The northern side of the 8,850-metre mountain lies in Tibet, a province of China. 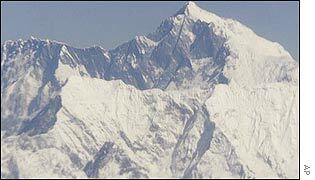 Mr Trumbull told reporters the climbers would try to reach the summit in May 2003. It was in that month 50 years ago that Edmund Hillary and Tenzing Norgay became the first men to climb Everest. More than 1,200 people have followed them to the peak so far. Nearly 200 people have been killed during or after their Everest climb. Despite the risks the Everest continues to lure the world's climbers. Mr Trumbull said 200 climbers had applied for the multi-religious Everest campaign. He said Buddhist, Christian, Hindu, Muslim, Jew, Confucian and Taoist climbers would form the Everest peace team. He said that the team would also include the veteran Nepalese climber, Ang Rita Sherpa, who has climbed the mountain 10 times without using oxygen packs.